"An Opportunity of a Lifetime"
The United Nations (U.N.) Seminar has been a vital part of the Ohio Christian Youth Fellowship (C.Y.F.) since the early 1960’s. From then to now well over a thousand young people from Disciples congregations around Ohio have had the opportunity to travel to New York City and Washington D.C. for a week. For many, this has been a life changing experience, witnessing the diverse ways that faith plays a part in the decision making of our nation and the world. "It was an awesome adventure." "I went 12 years ago, and I'm still in touch with the friends I made on the UN Seminar." "It changed how I see the world." "I'm doing what I do today, because of what I experienced on the UN Seminar." "I learned that faith has a place in government decision making." These are just a few of the comments made by the thousand or more young adults who have had the opportunity to be a part of the United Nations International Affairs Seminar Tour sponsored by the Christian Church in Ohio since the early 1960's. 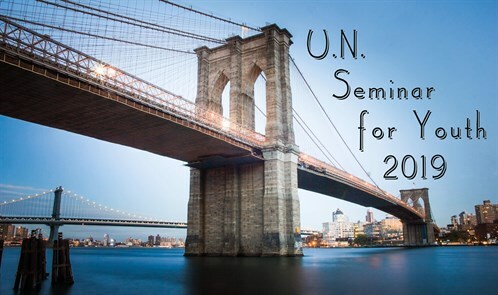 Better known by its short title, "UN Seminar", it is organized every two years to enable 45 Junior and Senior High School students from Disciples congregation around Ohio to experience how faith and government are linked together. contact Rev. Ralph Wearstler at revralphw@sbcglobal.net.